Set forth are data on the technology and equipment for the production of cast machinebuilding blanks by electroslag remelting (ESR) of metal waste, using additional alloying. Discussed are some variants of introducing alloying elements to the metal bath at electroslag remelting. By an example of making ES blanks of dies from grade 4Х5МФС tool steel there is shown the possibility of combining various alloying methods. Properties of such blanks are given. Key words: Electroslag remelting, alloying elements, metal waste, additional alloying. Discussed is the mechanism of hot tear formation, taking into account the presence of structural zones existing in castings and being characterized by different structure. Studied are the morphological features of hot tear structure in steel castings. Considered is an example of hot tear formation in the form of rupture in the surface layer of a casting, occurring stepwise (as a cascade). Key words: Defect, casting, hot tear, crystallization, macrostructure, microstructure, fractography, healing. 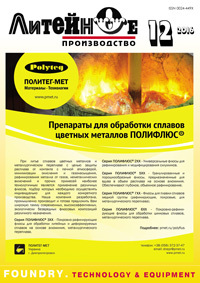 Described is experimental work on mastering the ladle inoculation for cast iron at OOO UAZ-Metallurgiya’s foundry. Shown is a method of improving the design of the ladle with a lid. Results of comparative testing of ladles with and without lid are given. Key words: Ladle inoculation, pouring ladle, high-strength iron. For the production of shaped castings of die-cast zinc alloy, proposed replacing expensive primary charge materials to secondary waste and scrap of these alloys. Analysis of raw materials metal raw materials charge material for smelting zinc alloys according to GOST 19424-97. Determined the proportion of obsolete scrap in the general structure of raw materials fusible non-ferrous metals is the share of the current waste. The basic source of the raw resource that is scrap zinc alloys. Proposed use of scrap and waste as the raw material for smelting vintage zinc alloys. Key words: Charge materials, secondary waste, zinc alloys, pressure die casting. The causes of appearance the defects like the surface contamination and surface breaking defects typical for the mold filling stage were determined. The technological measures to eliminate the causes of such defects are proposed. Key words: The mold filling stage, defects, castings of nickel super alloys. The paper examines variants of molding ceramic shell molds with different materials as backup fillers. An optimal backup filler composition – a mixture of quartz sand with boric acid – is proposed. Key words: Shell mold, backup filler, quartz sand, ceramsite gravel, boric acid. On the modern stage, the ways of overcoming of problem of resource deficit consist of rationalization of the use of present resource potential. Resursosberezhenie is rich in content based on the economy of expensive products got, foremost, on the basis of processing of oil and natural gas, and to replacement them on materials, producible from the second raw material of nature of renewable source of raw material. In this context it is expedient to utillize the second products of processing of vegetable raw material, due to expansion of application of LST materials. Key words: LST materials, castings connective materials, vegetable raw material, methods of increase of connective ability of technicall LST. The subject of article – compaction of green sand in the process of mould gravitational filling. The article discusses various options of filling with differing speeds of sand doses and with ratio of the sand dose and of the mould cavity. Key words: Gravitational filling, molding sand, density. When dimensioning the main elements of a gating system for small iron castings there was pointed out the necessity of correct choice of resistance coefficient ? taking into account the corresponding values of mass pouring rate MФ / ?. Key words: Cast iron, small castings, gating system, calculations.